Your local Auckland beading classes and tuition for creative and relaxing hobby. Forget about the rigours of life and give yourself some ME time. Enjoy a relaxing friendly atmosphere whilst learnng a new craft or enhancing the skills you already have. Be you new to beading or it is something you haven't done for a while come in and give it a go. I promise you will be uttering one of these phrases by the time you leave with your handcrafted masterpiece. "I could get used to this, it is so relaxing." "What a great way to relieve stress." "I had forgotten how much I enjoyed beading." When I first learned the art of beadweaving I did some private beading tuition and spent many hours reading books and looking up YouTube to find out how to do certain things. I have Adele (formerly of The Bead Hold Botany South) and Nia (Owner of The Bead Hold) to thank for their endless patience and great conversations on starting my beadweaving journey. The aim of my beading classes is to teach most of you the basics from the beginning of as many stitches as possible and gradually move on to more complex designs incorporating these stitches. This will also enable you to use the basics learned to attempt projects in books and magazines on your own. 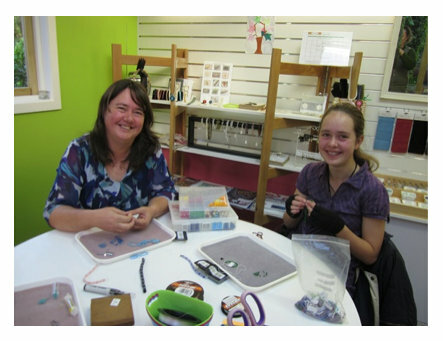 Beading classes are held in Howick Auckland, and are more suited to adults (l guess from 13yrs upwards) This ensures more one to one time in class due to smaller groups which is great for you. Find a class that interests you in our Auckland beading classes and a time that suits and make a booking. Full payment is required at time of booking to hold your place and bookings are essential. Classes cater to a maximum of 4 people. If a class has to be cancelled - you will be contacted to arrange a suitable replacement date. Please make sure that in the comments section you add the date and time of the class you wish to attend along with your email address. A materials list will be given once payment has been received. If you wish to pay via direct credit please email me for details. A 50% refund will be given if you cancel a class without booking a replacement. Class fees are for the actual class and then materials required are extra on top of that fee. Starting at $25.00 per person.